This week in the European Tour, we head to the UAE for the Abu Dhabi Golf Championship. This tournament has been part of the European Tour since 2006. 3 time runner up Rory McIlroy will be participating, hoping to take it down this time. He goes into this one as the favourite at 7/2 odds. Last years winner was Pablo Larrazabal, who comes into the tournament at a whopping 70/1. This is a great tournament which boasts quite a brutal field in terms of toughness. As we said Rory will be here, alongside the likes of Henrik Stenson, Martin Kaymer and Victor Dubuisson. Branden Grace is also 33/1. Coming in at a whopping 60/1, South African George Coetzee is no stranger to this course, and a relatively easy bet at those odds. That is a solid, solid record. Coetzee s best round was a 65, and the other times he floated around a 69-71 on this Par 72. In those 12 rounds, he hit par just twice. Coetzee is a very relaxed golfer, and loves to play in this type of weather. Bet: Coetzee E/W 60/1. Those odds can be found at Bovada for Americans. Another South African, and fresh off his 2nd place finish in the South African Open Championship we think Schwartzel is a good price at 33/1. He’s played at this tournament previously, where he shot a 64 on one day. He’s a solid golfer who is on form. Usually when he hits this form he can stay up amongst the money leaders and we think he’s got it in him to do just that. Bet: Charl Schwartzel E/W at 33/1. You can get Top 5 E/W at https://www.GTBets.com. The last couple of Abu Dhabi Golf Championship Winners have been big odds. You have to go back to 2011 when a favourite last won. Otherwise you have a 150/1 winner, 70/1 winner and 125/1 winner the last three years. 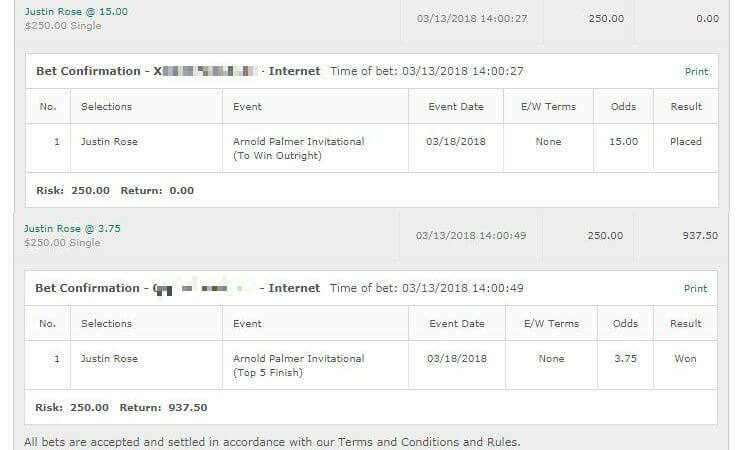 So we think what the hell, let’s take our usual 1 unit bet and then split it into 4, and bet 4 golfers around that price to pop the top 5. We’ll take Ernie Els at 70/1, Gregory Bourdy at 150/1, David Drysdale at 125/1, and Romain Wattel at 66/1. Those are just random bets for fun(with a little bit of strategy behind it) so don’t go betting billions on it. We’d be shocked if any crack the top 5 to be honest – but it adds some excitement to the tournament. Bet: Bet on all 4 at Bovada for Americans. A tournament that will be forever remembered for the massive 10 stroke drop on the last day by Martin Kaymer. Kaymer was trading at 1.01 going into the final round, and ended up coming in 3rd. Amazing. 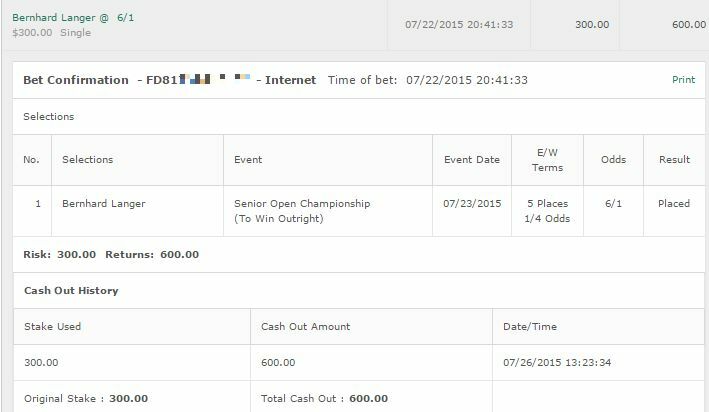 We came very close with a cash, with Charl Schwartzel. 33/1 we had him E/W to make the Top 5, and he was just a couple of strokes off that. 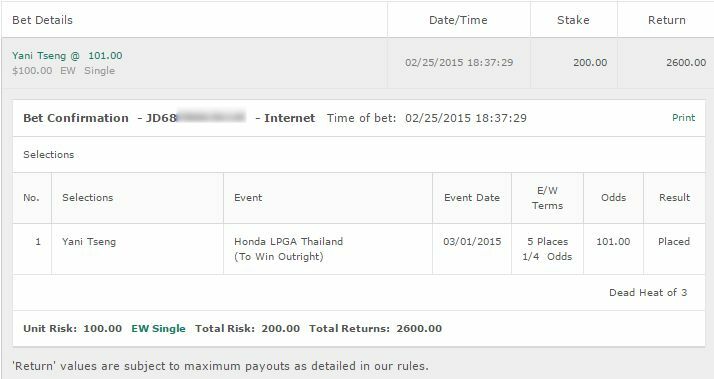 We also almost had a huge winner with Ernie Els, who was just a bet because why not type bet. George Coetzee struggled on this course with 2 bad days to come tied for 37th. -8 was still nice but didn’t really come close unfortunately.